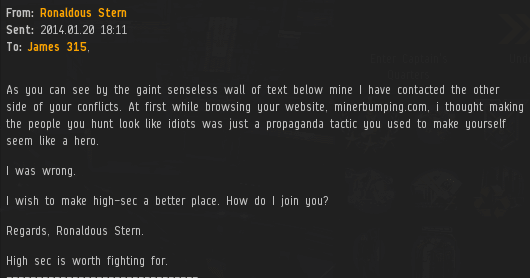 The world of EVE is filled with propaganda, lies, spin, etc. All of that stuff takes effort. My job is a lot simpler: I just tell people the truth about highsec. MinerBumping reader Ronaldous Stern wasn't sure what to make of all the posts I write. Is this an honest blog, or is it another outlet for EVE propaganda? Many "neutral" players wonder the same thing. Ronaldous took his curiosity a step further than most: He actually contacted a rebel leader to hear their side of the story. The rebel leader in question? liberty. Yes, that liberty. We've featured her literary works in previous posts. The MinerBumping posts made liberty sound like... How do I put this politely? They made liberty sound not very credible. Ronaldous went directly to the source to find out the truth about liberty. MinerBumping didn't exaggerate. liberty is liberty. Her reply to Ronaldous was another of her trademark paragraphless blocks of run-on sentences. She began by decrying Agent Bing Bangboom's "effective and dirty trick": declaring war. In the same breath that she admitted its effectiveness in keeping her alliance's numbers down, she claimed it "has in no way slowed us down". 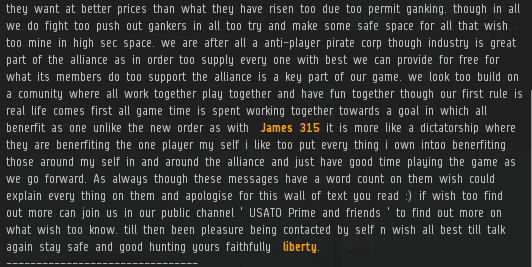 I'm not sure what liberty was driving at in this next section, but she admitted I have a lot of influence in highsec--so much so that her alliance doesn't seem worthy of my attention. Don't be so surprised, liberty. I'm the Father of the New Order. I'm a multitasker and I love all of my highsec children. Then liberty blames the New Order for causing "market prices" to "go up in price dramatically". liberty also claims the New Order is "reluctant to knuckle down and do the hard labour industry players do". Yes, because clicking the mouse a couple times an hour is so difficult. liberty concludes her attempt to win over Ronaldous by saying that the New Order is a dictatorship that only benefits one player: James 315. Is it true? No. Nearly 200 billion isk in New Order shares have been sold. Yet I am poor. Why? Because I am a river to my people! Needless to say, liberty unintentionally drove Ronaldous into the New Order camp. But if you want to hear things from the rebels' point of view, you can join the channel liberty advertised, USATO Prime and friends, to get it straight from the horse's mouth. Also; "because clicking the mouse a couple times an hour is so difficult." Classic James 315 right there. 1. Close Alliance, Close Corp. Thanks for the Cliff's notes on that one James. I usually decry people that say 'wall of text, tldr'. But after the first block of useless runnon crap, there was no way I was sifting through the rest. You will never see a gank or bump and you can go afk/bot all the time. I hate to be the one to tell you this, but Procs and Skiffs get ganked. It just isn't economically viable, for the most part. But they DO get ganked. How much does it cost gank one Procurer? i thought the Order is so rich 200bill? so why the hell it isnt possible? It's perfectly economically viable to gank procurers and skiffs. Consider the income in tears that you loot. the Order has 200bill or doesnt the Order has 200bill? What are you doing with the 200bill? A catalyst T2 fit cost approx. 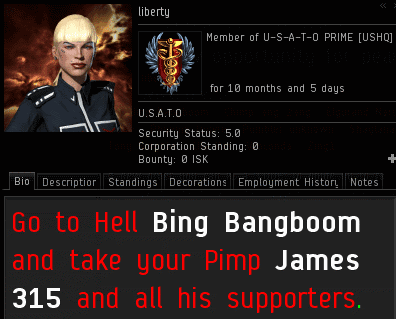 11-15mill (Jita / Rens / Ammar price). 200bill / 2 = 100bill . 100bill / 15mill = 13333 Thrashers & Catalyst. There are maybe 200 active gankers so 66 Thrasher & Catalysts for every member. Isnt that enough? Or diid James 315 spendt all the ISK for Plex and new Titans? All donated isk is distributed to members of the New Order for the ships mentioned above (minus the Titans). "...Why? Because I am a river to my people!" You carebears really need to learn how to read and pay attention better. No Procurer / Skiffs are ganked! Everyone can use them : Theres no gank possible! usually miner ; not one of these idiots carry a Plex in it! 1. If everyone flew a procurer/skiff to mine, then X. A. Implausible, will never happen, so X is irrelevant. B. Even if it did happen, the response would just be CCP nerfing skiffs/procurers, and the New Order moving on to the next easiest bot-aspirant target, changing tactics, etc. C. Going afk in a procurer/skiff is pointless, small cargo hold makes it unuseful. dont forget to activate orbiting at 500-1500m around asteroid you will have pure protection vs. bumping,too. A procurer with a meta tank costs ~20mil ISK. Factor in insurance payout and a player can be expected to lose ~10million ISK when ganked. A ganker, assuming he retrievs his dropped mods loses 5mil per ship. At best, a ganker can deal roughly 15k damage before dying in a 0.5 system with a CONCORD prepull. Even a crap skilled pilot can boast well in excess of 50kEHP (up to 70k with good skills). This means that the 4 gankers required to down a procurer will cost 20million ISK in best case scenario. 20mil ISK loss for gankers, 10mil ISK loss for procurer pilot. Who's complaining that miners don't have enough defense? CODE. lost over 1000 ships in January 2014 alone, and almost 9000 ships since Jan 2013...and those are just losses where a player is involved. Losses inflicted only by Concord do not generate eve-kill lossmails, Total gank ships lost is well over 10,000 and could be double, when you count multiship ganks and failed ganks. How do you think we've killed over 19,000 ship, but "only" have 9000 losses, when we die every gank? Skiffs and even Procurers can be ganked economically. The highest bang:buck for ganking are Catalysts that cost about 1.6m and achieve 400 DPS. It takes five to kill a moderately tanked Procurer. The problem is just that it takes a lot of gankers, and it takes valuable gank-time that can be applied elsewhere, and usually for much more effect. Make no mistake, though. All miners are vulnerable to economic gank. If every bot-aspirant miner started flying a Procurer tomorrow, the NO would still gank them. did someone say skiffs are not gankable? Sacrificing yield for tank and flying a Skiff is a victory for the New Order. Seeing Skiffs in the belts always makes me happy. I like how suddenly this is news that procs/skiffs are rarely ganked by us. Heck, you can find forum posts by me telling new players to buy procs. But hardly anyone does because you can't hardly even make a sammich before the things are full. You actually have to play the game. Much sad, no AFK. This doesn't surprise me. Entitled rebs/carebears need some sort of a victory, so they go with something we've been talking about.. since.. they came out and they declare the skiffs/procs are ungankable.. which they're not, but we know that. I like how you told people to use them, I did as often as I could, but like you said the cargo hold (ore hold) was never big enough for them. And like what John was saying, any miner in a proc, but especially a skiff, is doing it right and is a victory for the New Order. Step 1: Miner decides to fly a tanked up proc so they can mine in peace. Step 2: Miner realizes all the rets and macks around him are mining faster than him, and that without gankers, those rets and macks are "beating" him, while botting and/or afk. Step 3: Miner realizes that gankers, who prey on these macks and rets, are now benefiting him, as a procurer miner. Step 4: Miner is converted to loyal New Order Miner. Obviously, each of these steps requires a modicum of thought, so they may take quite a long time for some miners, but the point is clear: shipping into a procurer is the first step to becoming a loyal New Order supporter. These rebels who advocate for all miners to jump into procurers are benefiting the New Order hugely. I love liberty! Whenever she's in local it makes waiting for the GCC to run out seem so much faster when engaging in conversation with her!